Lighting accounts for close to 20 percent of the average home's electric bill. Most of us can cut our lighting costs in a few simple steps. Start with conservation. It’s free and you can do it today. Open curtains and shades to bring in daylight and reduce the need for electric lighting. Consider an occupancy sensor if you have lights that are frequently left on when no one is around. The next step is to purchase energy-efficient bulbs for your fixtures. The three most common types of bulbs are light-emitting diode (LED), compact fluorescent (CFL), and energy-saving incandescent. Be sure any bulb you buy is ENERGY STAR qualified, which means it meets energy-efficient standards. The LED is one of today's most energy-efficient and rapidly developing lighting technologies. ENERGY STAR-qualified LEDs use only 25% of the energy, and last up to 25 times longer than the traditional incandescent bulbs they replace. While LEDs are more expensive at this early stage of development, they still save money because they last a long time and use very little energy. 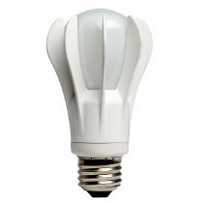 LED bulbs are available in a range of colors, including warm white. CFLs are simply curly versions of the long tube fluorescent lights you may already have in a kitchen or garage. An ENERGY STAR-qualified CFL uses about one-fourth the energy and lasts 10 times longer than a comparable incandescent bulb. CFL bulbs are available in a range of light colors, including warm tones, and work best in a fixture that is used for at least 15 minutes at a time. Dimmable CFLs are available, but dim differently than incandescent bulbs. Incandescents dim smoothly from 100% of their light output to no output and their light color changes from a bright white to a warmer yellow. Dimmable CFLs maintain light color more consistently and dim to 10–40% of the original brightness. CFL dimmer switches are available that take this difference into account and can improve the performance of your dimmable CFL. A spiral CFL won’t last as long in a fixture with low air-flow, such as recessed lighting. For these types of fixtures, use a CFL specially designed for recessed lighting or an LED bulb. Covered CFLs, such as globe bulbs or recessed reflector bulbs, need a little time to “warm up” and reach full brightness, so they are less suited to a light that is turned off and on frequently. Use the ENERGY STAR guide to help choose a CFL bulb. Energy-saving, or halogen, incandescents have a capsule inside that holds gas around a filament to increase bulb efficiency. This type of incandescent bulb is about 25% more efficient and can last up to three times longer than traditional incandescent bulbs. 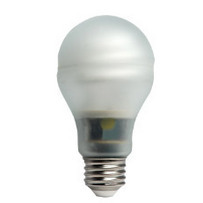 Energy saving incandescents are available in a wide range of shapes and colors, and can be used with dimmers. 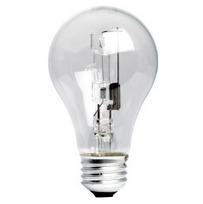 Replace a 60W bulb with a bulb that gives you 800 lumens. Replace a 40W bulb with a bulb that gives you 450 lumens. The Energy Independence and Security Act of 2007 (EISA) includes new energy-efficiency standards for light bulbs that began to take effect on January 1, 2012. The purpose of the law is to make light bulbs 25-80% more efficient than standard incandescent bulbs. Many manufacturers are developing more energy-efficient incandescent bulbs to meet the standards. A growing number of CFL and LED are also available. When CFLs burn out, state law requires recycling. CFLs contain a small amount of mercury, which is harmful to the environment if put in the garbage. Many local hardware stores collect used CFLs, as well as Lowes, Home Depot, Menards, and IKEA. For a list of retailers that accept used CFLs, go to www.earth911.org or the EPA web site. Your county household hazardous waste program may also collect them. Find your county’s HHW program at www.pca.state.mn.us/hhw. Living in the Avon Hills is a conference about arts, land use, natural history, wildlife, and alternative energy. This family-friendly event is put on by the Avon Hills Initiative and St. John’s Arboretum, February 25, St. John’s University (Collegeville). The Twin Cities Sustainable Communities Conference, organized by the Alliance for Sustainability, will link volunteer leaders from neighborhoods, gardens, congregations, and schools with project resources, March 24, 8:30 a.m.-3:30 p.m., U of M McNamara Center (Minneapolis). Solar Works in Central MN: Workshop & Resource Fair is a Clean Energy Resource Teams event that will connect you with solar experts serving central Minnesota. You'll learn about your site, specific technologies, financing options, and your solar resource, March 28, 1-4 p.m., Riverside Park (Saint Cloud). The 8th Annual Community Garden Spring Resource Fair is organized by Gardening Matters, a Twin Cities based non-profit dedicated to successful and sustainable community gardens in Minnesota. The Resource Fair is one of the key venues in which people are able to come together to share, imagine, and create stronger communities through gardening, March 31, 9 a.m.-4:30 p.m., Neighborhood House (St. Paul). Living Green 365 is a newsletter of the Minnesota Pollution Control Agency. If you have questions or comments for Living Green 365 pleas send them to the address below.